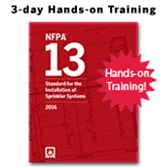 Gain the knowledge required for the design, installation, and analysis of sprinkler system installations using the 2019 NFPA 13, Standard for the Installation of Sprinkler Systems. Please verify applicability with your professional board before registering. Note that Viking is located nearby. Ask for the Viking negotiated rate when booking.